Our custom garden furniture covers will provide essential protection from ultra-violet light, dirt and adverse weather conditions, keeping your garden furniture protected. It takes seconds to put a cover on your expensive outdoor furniture or barbecue, keeping them protected from the traditional British Summer weather. 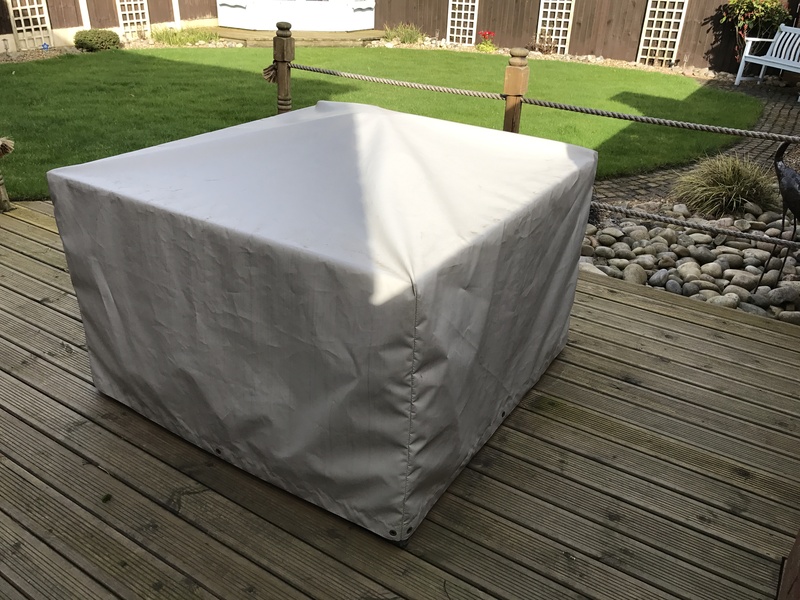 Our customers can keep the cushions on their garden seats over the summer, knowing they will be protected by one of our custom garden furniture covers. A well fitting custom garden furniture cover will also enable you to store your larger garden items outdoors during the winter, freeing up valuable storage space in your shed or garage. We do, however, recommend that cushions should be stored away in a dry environment like a shed or garage over winter. This will ensure they are not damaged by condensation forming under the PVC cover. We can manufacture covers to fit your chairs, table, bench, patio set, hammock, swing seat, barbeque or anything else you need to cover in your garden. We can make a custom garden furniture cover from your measurements and our experienced staff will guide you to the specific measurements required for your item of garden furniture. We use a durable 580 gsm PVC coated polyester for our custom garden furniture covers with brass eyelets and 6mm shock cord or rope. We have a range of different colours available and can also provide digitally printed covers. We can also offer a repair service, carrying out small and large repairs to PVC garden furniture covers. We are able to make repairs on weldable PVC coated fabrics using portable hot air welding equipment. We have also provided our customers with replacement PVC canopies for their swing seats if they have gone beyond repair. Give us a call to discuss the type of cover you need – no cover is too big or too small.